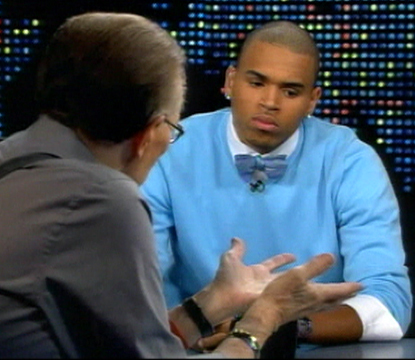 Chris Brown has issued a statement explaining that an advance clip of his interview with Larry King, set to air on Wednesday night on CNN, has been taken out of context, and, in fact, he does remember the incident with Rihanna that led to him pleading guilty to assault. “When you look at the entire interview you will see it is not representative of what I said,” Brown said in his statement regarding his “no” answer. “The first four times – or how ever many times it was – I gave the same answer – which was that I didn’t think it was appropriate for me to talk about what happened that night. I said it was not right for me and it really wasn’t fair to Rihanna. The fifth time – or whatever it was – I just misspoke. I was asked, ‘Do you remember doing it?’ and I said, ‘No,’” Brown’s statement continued. Brown added that he continues to live with remorse over the incident. People was first to report the story.